Do animals overeat? Get breast cancer? Have fainting spells? Inspired by an eye-opening consultation at the Los Angeles Zoo, which revealed that a monkey experienced the same symptoms of heart failure as her human patients, cardiologist Barbara Natterson-Horowitz embarked upon a project that would reshape how she practiced medicine. Beginning with the above questions, she began informally researching every affliction that she encountered in humans to learn whether it happened with animals, too. And usually, it did: dinosaurs suffered from brain cancer, koalas can catch chlamydia, reindeer seek narcotic escape in hallucinogenic mushrooms, stallions self-mutilate, and gorillas experience clinical depression. Natterson-Horowitz and science writer Kathryn Bowers have dubbed this pan-species approach to medicine zoobiquity. Here, they present a revelatory understanding of what animals can teach us about the human body and mind, exploring how animal and human commonality can be used to diagnose, treat, and heal patients of all species. I bought this book because it’s title and especially description drew me in. I love reading about animals and health and this book merges the two. After explaining why animal and human science should be taking a cue from each other in the first chapter (which you can read by going here and choosing Chapter 1), each additional chapter covers a specific issue that affects animals and humans: Fainting, Cancer, Sexuality, Drug Use, Heart Attacks, Weight Issues, Self-Injury, Eating Disorders, Infection and Adolescence. Adolescence probably seems a little out of place because it’s not a health issues per say but that chapter discusses how adolescents are risk takers in humans and animals and why that may be. This is not just a book of someone’s opinions, the authors have done their research and include 40 pages of notes at the back of the book citing books and studies that helped them out with each chapter. This is a well researched book from professionals who know what they are talking about. I couldn’t believe that animals get the same problems we do and yet vets and physicians don’t collaborate more with regards to them. The book is about that but it’s also about understanding more about those diseases or conditions by seeing how they affect and are overcome in non-human animals. For example, as someone who struggles with mental health issues, I was shocked to see that animals self-injure and suffer from eating disorders. I had never considered that could be possible. It was shocking. Understanding what makes animals do these negative behaviours helps me to understand why I or someone else might start these behaviours. This book is eye opening and a book that every physician and veterinarian or anyone else involved in health care for animals or humans. 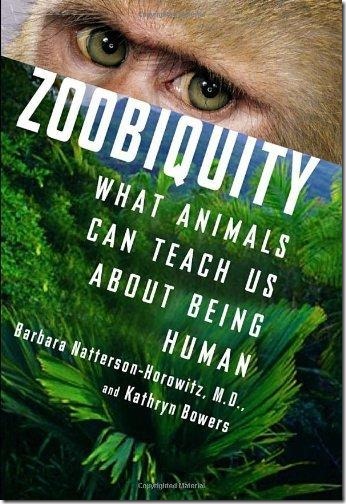 Buy Zoobiquity (the newer one) from Amazon.com and help support the blog.